Digital and Analog Test System Platform | Marvin Test Solutions, Inc. 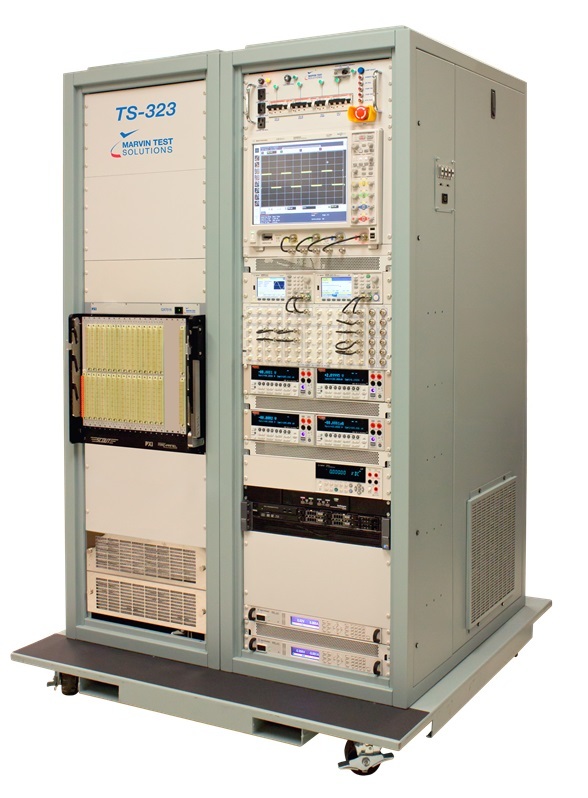 The TS-323 GENASYS platform is a PXI based test system designed to address a broad range of mil-aero and mission-critical products that require performance functional testing. The GENASYS offers best in class digital test capabilities which can effectively address the test needs associated with legacy ATE systems including the Teradyne L200/L300, GenRad 2750 and VXI-based digital systems. The TS-323 is available with range of digital and analog instrument options for addressing both LRU and SRU test needs as well as supporting depot and manufacturing test needs. The TS-323 switching subsystem supports "any resource to any pin" architecture and scalable architecture. The TS-323’s core system includes the GX5960 digital subsystem which offers best-in-class performance digital test capabilities. Featuring a 50 MHz vector rate, programmable voltage levels per pin, timing per pin and multiple time sets, the GX5960 subsystem provides all of the features necessary for complex functional testing or for legacy test program migration. Additionally, the GENASYS platform provides access to an analog bus, allowing each digital channel to have hybrid signal capability when configured with an analog switching matrix which provides any resource to any pin signal routing. For multiplexed pin configurations, the GENASYS can be configured with 1:16 multiplexer switch cards, providing over 4500 multiplexed pin connections to the UUT interface. The scalable architecture allows multiple configurations starting at 64 digital pins, and a mix of low frequency and high frequency switching channels with matrix, multiplexer, or Multi-Matrix topologies. Also included are system power supplies and environmental monitoring. A wide range of optional instrumentation and switching is available, allowing the GENASYS to be configured for a customer's specific needs. GX7005A 20-slot, PXI chassis with (19) 6U peripheral slots. High density, 8000 I/O Scout receiver with integral direct access adapters, providing a reliable and high performance wireless interface from tester instrumentation to the tester’s receiver interface. In addition, a wide range of 3rd party PXI, cPCI, and GPIB instruments can be integrated into the test system to meet specific test needs. The TS-323 is delivered with a system self test which includes an interactive self-test software procedure as well as a self-test adapter. The self-test verifies functional integrity of the system and resource connections to the test system interface. The TS-323 includes ATEasy, a test executive and test programming software suite as well as all of the necessary instrument drivers. The TS-323 also include SwitchEasy that simplifies the programming of the switching subsystem and an L200 driver to assist with the migration of L200 and L300 programs. In addition, for applications that require the importing of LASAR .tap files, optional DtifEasy can be used to import and execute LASAR-based digital vector files for go / no-go, fault dictionary, and guided probe applications.